I Have Run: Happy Monday? Love: Spending time with family at weddings and family reunions. Not So Much: The extra lbs that came with the food and fun-filled weekend. Love: My new purse from Banana Republic. I am near the end of the diaper bag era and I found a great purse that is perfect since I still need to pack around some diaper bag essentials, such as the diapers. Not So Much: The purse I bought at a purse party for $18 that started falling apart the first time I used it. Guess that is why you pay what you do for a purse at Banana Republic. 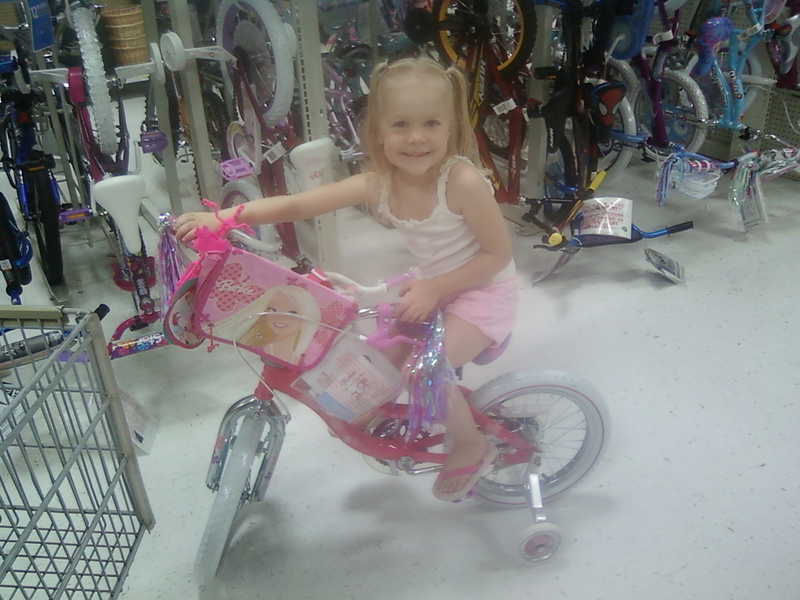 Love: The Princess's* excitement to earn a big-girl bike. Not So Much: The Princess was talking to me while I was showering this morning, and I couldn't hear her over the water. She stomped over to the shower door, put her hand on her hips, and said, "Fine. Whatever. I'm done." Waaaayyyy too familiar. Love: Getting my July Runner's World in the mail today. Not So Much: Knowing I have to go to the post office multiple times this week. Love: Getting caught up on my blog reading to keep me inspired and motivated. Not So Much: Choosing between reading blogs and reading the ginormous book I just started (Under the Dome). Okay, so this one isn’t so bad. Not So Much: My new Internet Service Provider (selected by our HOA, not by me). I have no patience when it comes to the Internet not working, and it has been ridiculously intermittent since the change. It has been so bad that I had to wait for my husband to get home to use his work computer with its satellite Internet (or whatever it's called). RUN: Newest songs on my playlist: Break Your Heart (Taio Cruz feat. Ludacris), Bulletproof (La Roux), and I Gotta Feeling (Black-Eyed Peas). *My 4-year-old will now be known as The Princess and my 1-year-old will be known as Bean on my blog. 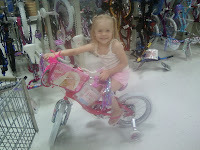 We've been working w/ our girl and her bike for some time. Maybe I will just skip it and teach her how to run really fast. I totally need a new purse but just cant seem to find any good ones! Hope your Monday went ok!! i still haven't gotten my RW! Hope it comes today! Those songs are awesome. My 3 year old rocks out to break your heart! Under the Dome is a great book, but ungodly long. Ha! It's so scary when they start using those grown up phrases!